The city of Bilbao, situated in the north of Spain, is close to the coastline and beaches and is the largest and most lively city in the Basque Country. It is a particularly historic city, with a legacy of old buildings and a rich culture. Bilbao is comprised of a fascinating mix of the old and the new, with many spectacular contemporary buildings. This Basque city dates to the 13th century, yet pilgrims have been passing through Bilbao since 1000. 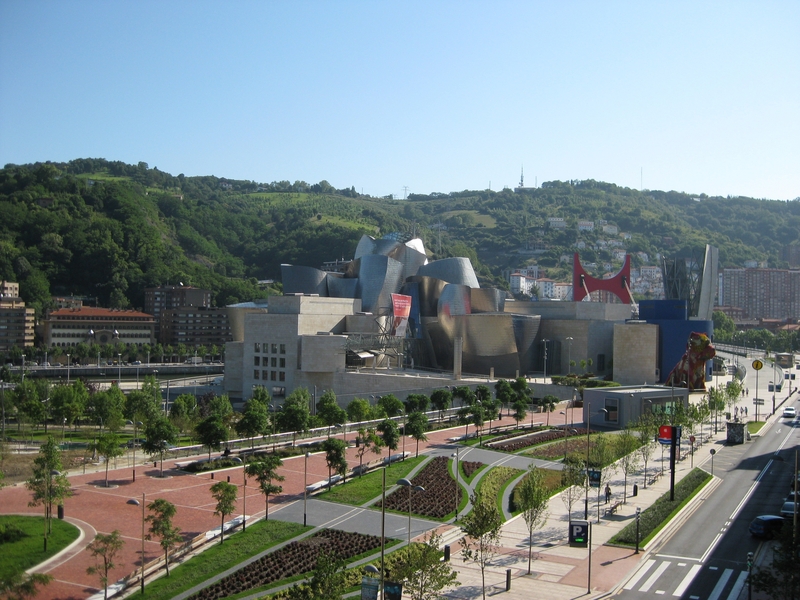 The Bilbao Guggenheim Museum, designed by American architect Frank Gehry, is a work of modern art itself, and quite the focal point on the beautiful pedestrian promenade and river walkway. The Fine Arts Museum, second only to the Prado in Madrid, is as classic as the Guggenheim is modern. The city has an abundance of parks and fountains and sidewalk cafes. I arrived on the most perfect summer Sunday afternoon, and it felt like the whole town was out enjoying their lovely city, the young and the old all strolling and visiting and soaking up the sun. The Basque cuisine is fabulous! The tapas and pintos are not only delicious but also works of art! The variety is endless; crab, shrimp, cod, salmon, cured ham, egg, spinach, eggplant, beef tartar, and on and on. 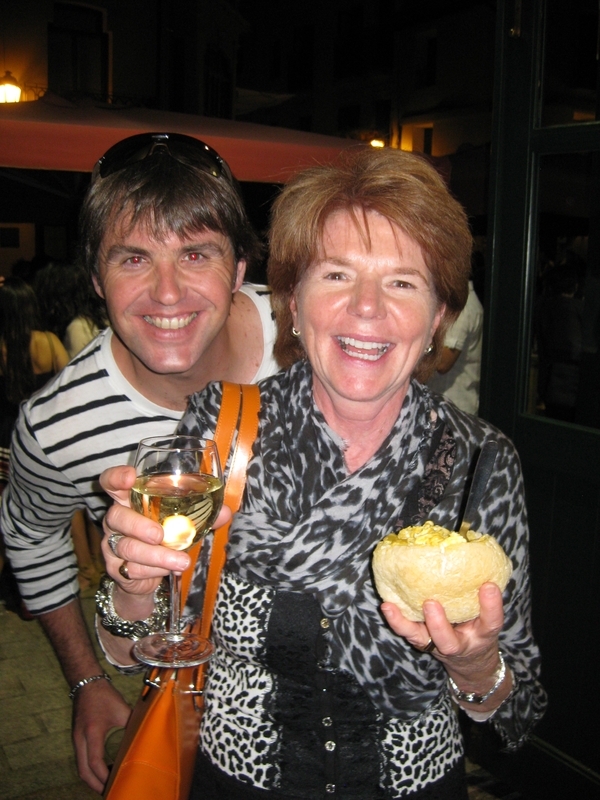 The locals enjoy a glass of wine or Cava, nibble on 1 or 2 pintos, visit with friends and then move to another. The region has many innovative restaurants as well as traditional. Enjoying tapas and wine with our guide and golf pro David. Cuisine plays a huge role in local life, as does wine. 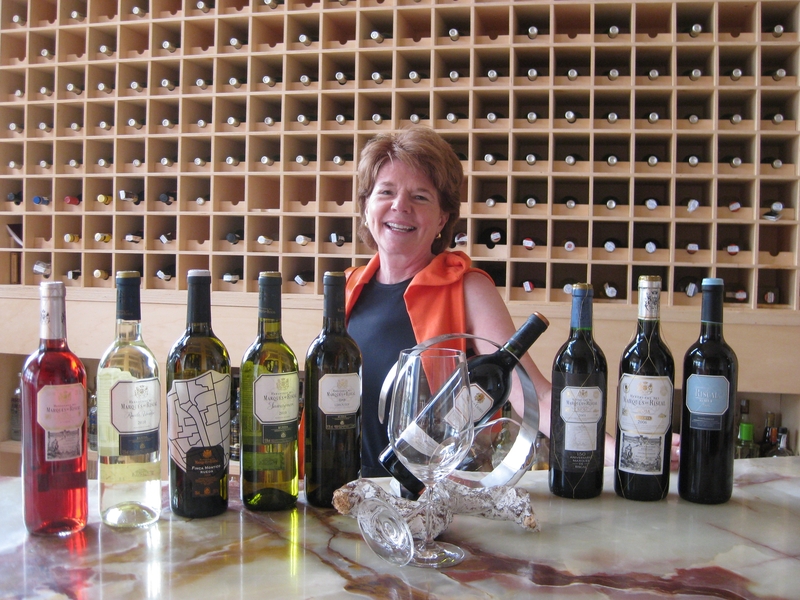 Michelin-rated restaurants abound, as do bodegas (wine cellars) offering wine tastings and tours throughout the year. I enjoyed the wine bar at the Marques de Riscal hotel. 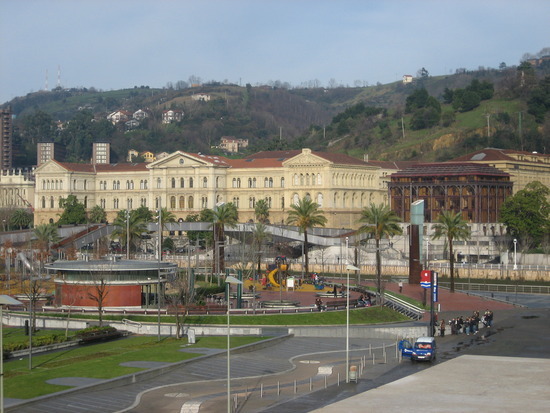 The University of Deusto is Spain’s largest private university, run by the Jesuits and with campuses in Bilbao and San Sebastian, and dates back to 1880. The Basque and Rioja regions include the Pyrenees for skiing, climbing, caving, and canoeing. The coastlines are made up of rocky coves and wide bays with yellow sand beaches, and are interspersed with fishing villages. Inland are forests, valleys, and gorges. The south is populated with abundant vineyards and food crops. San Sebastian, situated on a neat, shell-shaped bay, is considered the most elegant and fashionable Spanish seaside resort. The city itself is renowned for its great summer festivals, featuring both jazz and classical music as well as art, theater, and the international film festival in September. Bullfighting is still a very serious sport in Northern Spain and even the smallest villages feature “the running of the bulls” as an event in their regular summer festivals. 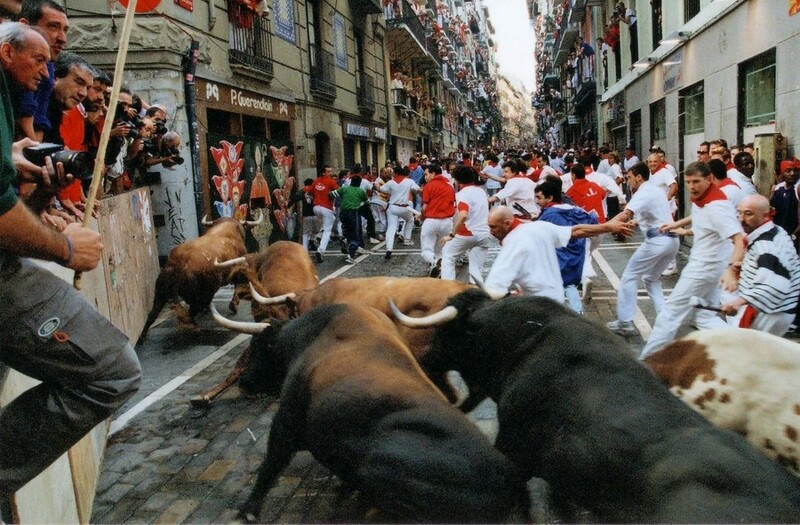 The old fortress city of Pamplona holds the largest event in July, during the festival of Los San Fermines, with its daredevil bull running followed by traditional bullfights. For more pictures and information, visit the Journeys Viaggio Facebook page, and check out http://www.youtube.com/watch?v=CKv-hBowhVY for a full slideshow. Le Cinque Terre (the five lands) are a group of five picturesque villages along the coast surrounded by terraced vineyards, olive groves, and forests. The villages can be reached on the train that runs between La Spezia and Genoa or by ferry from La Spezia, Portovenere, Levanto (the next village up the coast toward Genoa where there’s also a train station), as well as other Italian Riviera villages. There are popular hiking trails between the villages as well as in the scenic hills above them. One can easily blend one or two hikes between the villages with a few minute rail ride between others, hence have time enough to visit all of them in one day. 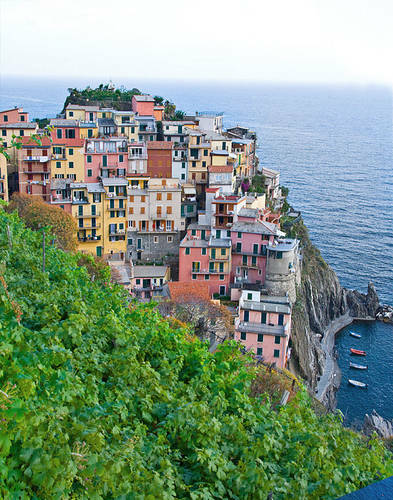 The Cinque Terre region is very popular with Americans and is crowded in summer. Spending the night in one of the villages is a good way to experience the charm without the huge crowds since the majority of visitors only experience Cinque Terre as a ‘day trip’. Lodging is very limited….but worthwhile if you can land a room, since evenings are quieter. I strongly recommend that room reservations be secured many months in advance if you plan on overnighting in Cinque Terre. Simple 3 star hotels, generally family owned and operated, will cost Euro160 per night for two in high season including breakfast. For one of the few 4 star options requiring a 2-3 night minimum, add another Euro 100 per night. The little bitty cove beaches are packed with sun bathers. Umbrellas and chaise lounges are available for rent each day, but don’t expect much peace or quiet or private space, though it is festive and colorful. All of the villages have shopping and dining options, Monterosso al Mare being the largest .. offers the most services for visitors, including a little nightlife in high season. And Monterosso is accessible by car..though you will not want to explore Cinque Terre via car once you arrive. Enjoy these charming fishing villages soon, as civilization is encroaching on these once very isolated hamlets.